Your practice is more than just a place where patients come in for exams and tests, clinics of all kinds are full-fledged businesses too. So it's important to find office solutions that are going to enhance patient experiences, while also optimizing the business functions of your office. The software that you run your practice off of should be built as a good investment that will help increase the efficiencies of everyone in your practice, all while maximizing your profits. While every practice is unique and has different needs as to what features and benefits a system has that make it the most optimized, it's not possible for one system alone to have every possible feature that you could ever want. But we've pulled together a few features that most eyecare practices are looking for across the board. When we talk about interoperability, we're talking about the ability of different software systems to communicate efficiently and work seamlessly together to exchange information. Interoperability can also be used to describe the effectiveness of practice management and EHR software. Having a system that is your end-to-end solution for practice management and EHR is going to help reduce duplicate data entry and boost your workflow efficiency. On top of reducing duplicate data entry it also reduces the need for jumping between screens of different systems. Having a complete solution is going to provide a seamless workflow from patient contact to scheduling to appointment check in to the exam room to billing and follow up. Data security for any medical practice is a big concern. And, security of your information is different depending on what type of technology you're using for your system. While cloud-based systems might make you nervous when it comes to securing your data, they shouldn't. Cloud-based practice management and EHR systems run in enterprise-class data centers, where back-ups to your data happen automatically. This makes it possible for even small clinics to have exceptional data security and back up at a reasonable cost without worrying about having the technical knowledge of maintaining security and back up of an onsite server. Everything today has gone mobile, even healthcare. So having access to your system and patient information when you're out of the office is becoming increasingly more important. While there are a lot of systems that provide some type of web access, if the system wasn't built specifically for the Internet, it's web-based performance will probably be insufficient, with limited data access and costly add ons. True cloud-based systems will give you anytime, anywhere access from any device with an Internet connection. Tablet or computer - your choice! Getting familiar with a new system can take some time for you and your staff, but it's important that the change in your workflow isn't noticable to your patients. Not only can this implementation time be time-consuming, but depending on the type of system, updates and upgrades can also be lengthy experiences with associated costs. With cloud-based systems you're able to get rid of the IT hassles of installation, updates, and upgrades - as these all happen automatically and are handled by the vendor. This allows you and your staff more time to focus on using the new tools and implementing them in their daily routine. 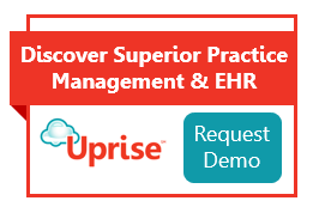 If you're interested in learning more about a cloud-based practice management and EHR solution for your practice, check out Uprise!